“I am proud. I am strong. I am special because, I am somebody,” sang a group of three-to-five-year-old Southern Illinois University Edwardsville Head Start/Early Head Start students. The preschoolers were part of the black history program, “Because They Did, We Can,” presented Friday, Feb. 23 by the Discovery Center for Little Scholars (DCLS). DCLS students from six weeks to five years were part of the performance for family and friends. 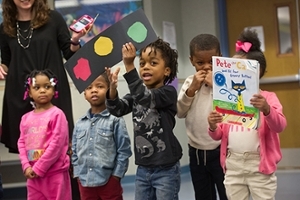 A group of three-to-five year olds performed “History is a Part of Me” and told of African Americans who created such inventions as the elevator, dryer, fire extinguisher, traffic light and fountain pen. 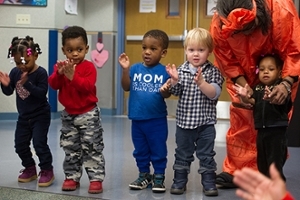 SIUE Head Start/Early Head Start students (ages 16 months-2) from Discovery Center for Little Scholars perform “If You’re Free Clap Your Hands,” with the assistance of teacher Benny Lewis. Discovery Center for Little Scholars students (ages 3-5) present “History is a Part of Me,” with the help of teacher Megan Redman.